02:40:00 Makes 16 servings, 1/2 cup (125 mL) each. Makes 16 servings, 1/2 cup (125 mL) each. We’ve taken a favourite pasta salad and made it over using better-for-you ingredients to save on calories and fat. 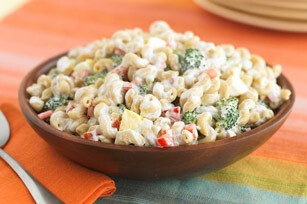 Same great taste, same easy prep steps, one great macaroni salad. Cook macaroni in large saucepan as directed on package, adding vegetables to the boiling water for the last 2 min. ; drain. Rinse with cold water; drain well. Mix Miracle Whip, sour cream and mustard in large bowl. Stir in macaroni mixture and eggs. Sprinkle with paprika or smoked paprika before refrigerating. We've taken a favourite pasta salad and made it over. We substituted multi-grain macaroni for regular macaroni. We also substituted Miracle Whip Calorie-Wise Dressing for regular dressing and low fat sour cream for half-and-half. This version saves 30 calories and 3 grams of total fat per serving. The broccoli and pepper team up to provide a good source of vitamin C! Serving Size Makes 16 servings, 1/2 cup (125 mL) each.